Wanted to start a thread specifically for the Chaparral Signature 350 where we could discuss topics, successes, and failures! I purchased a 2005 Chaparral Signature 350 late last season and had her shrink wrapped and dry docked. I would like to order my vinyl decal/boat name logo to go on the trunk storage lid. I am unable to measure the space or find the dimensions online, from chaparral, or parts dealers. I was hoping someone might know the dimensions or is able to measure the space on the trunk storage lid where the lettering would go (width: end to end x height: bar to 350 logo). Any help would be greatly appreciated. We put a new name on our 2006 350 this past season, If i visit the boat tomorrow, I will get the measurements you are requesting. We are upgrading the stereo and speakers this winter and perhaps upgrade one or more of the TVs. Welcome and congratulations on your purchase! I'm the original owner of an '04 sig. 350 and I love the boat as much today as ever. I'm shrink wrapped so can't weigh in on the transom dimensions, but sounds like others can. A few of my successes are I switched out the tach with a direct plug and play unit from Cecil Marine. Our boats have an out of production gauge series, but Cecil stocks replacements that look and work great. You'll probably need a gauge or two unless your lucky. I replaced the stock battery charger with a Promariner Pronautic 1240P charger. Far and away an improved performer for battery charging in my experience. This is a bit involved as you have to increase wiring size and associated battery charger breakers for each bank. I also increased the house battery size to group 31 and added a 2nd one. To finish these upgrades I added a BEP battery gauge in the salon. Maybe overkill, but we spend about 20 nights a season overnight on the hook plus countless afternoons rafted up and it's great having more amp hour capacity and knowing the state of charge. My experience is the stock DC volt meter in the breaker cabinet is total crap as far as accuracy. I also added a fresh water tank gauge mounted in the breaker cabinet. Again, knowing what I've got left as far as fresh water is good for me. I can't believe Chap didn't have a fresh water gauge on these boats. I did have to replace the original windlass last season, but there is a direct mountable replacement that only requires a single hole to be drilled for routing wiring. Like TidalPotomac, I'm upgrading the stereo this Spring. My original JBL head unit died and isn't made any more. That means the helm and transom remotes are now useless too. I'm leaning towards the Fusion UD650 and just won't use the remotes. I'm still deciding and there are numerous posts on the forum you can read if yours needs replacing. For me, that's pretty much it other than maintenance or replacement items along the way. If you have any specific questions it's very possible I've encountered them or other 350 owners have so feel free to pm me or post on this thread for broader response. 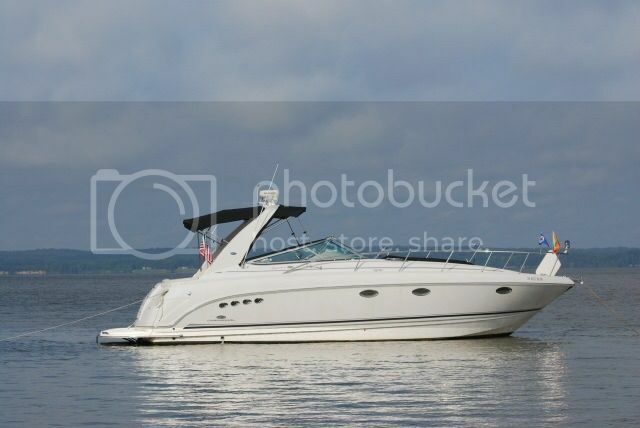 Can't wait for boating season....especially here in MD after getting 29" of snow this week! I have an 04 350. I just upgraded the stereo to the Fushion UD750. I wired this into my garmin 7608 using the nema 2000 backbone. You can also download the Fushion app to you phone and control all the functions over the phone, no longer requiring the front and rear remotes. I won't make it by the boat this weekend, will check on the measurements next weekend if still needed. No problem Tidal! Thanks so much! Yes, the UD 750 fit in without modifications. I did have to pre-drill 4 holes to secure the unit. Now it is solid as a rock. The advantage the 750 has over the 650 is 4 zone separation. My boat utilizes 4 zones with all the speakers and subs I have on board. Also if you are going ahead with the purchase, go by Best Buy and pick up a car antennae, plug this into the back to the new unit and lay the antennae on the ledge inside the cabin. What a difference, great reception. Bernie (nice name BTW), have you considered getting your boat name painted on instead of decals that fade and delaminate? Our local marina told us about a guy that hand paints any design you want, so we had ours painted on for less than 200 deer back in 2007 and it still looks great. We purchased the boat knowing about the XDP drives and with the intention of replacing them during the first season. The previous sump pump had a sticky float valve, causing the water to overflow and settle into the bilge compartment below. The fuel injector cleaning significantly improved the running of the engines. Those with older 350's, check your motor mount areas, especially on the transom side to detect any cracking in the gelcoat/fiberglass. If you detect cracks, don't freak out, chances are the structure of the wood underneath is solid and can be repaired work is as good as new. The delamination is fiberglass pulling away from the wood, a small amount, causing cracking. The delamitation is somewhat common on the bigger boats with big engines. We had our delamination addressed by a professional while the engines were removed. Dimensions of the transom hatch you requested are 49 1/2" wide and 20 1/2" from bar to 350 badge. And thank you everyone for the great advise! I like where this thread is heading!!! I am looking at the Fusion as well. Really like the iPhone/iPad/Raymarine integration! Someone post some pics of your fusion installations! Anyone have any advise on TV antennas vs Satalite vs WiFi/Cellular with smart TV's???? Sorry to chime in even though I don't own a Sig 350 but just wanted to say that they look so sleek, especially if you look at Tidal's signature pic. What a really good looking boat and by the sounds of it you guys seem to hold on to these for a long time, ey? They're that good of a boat? I did want to ask if they made an upgrade from the arch/bimini to a hardtop? Just curious, nothing wrong with the arch and bimini I have it on my 276 and love because of it's flexibility, but was just curious if that was an available upgrade for those models? Yes, it is available with a hard top, although I'm not sure what year that started and this model isn't made anymore either. It might have started when the model designation became the " Signature 370". Same boat, but the new # reflects the LOA. I do think the hard top on this boat is kind of lame though. Doesn't cover all that much and you still have plenty of glass to deal with. It does look cool for sure and probably adds nice rigidity for cruising with glass up, but I'm an open air boater anyway, so only put mine up in bad weather. In my opinion all boats have pros and cons of course, but in the mid sized cruiser category this boat has the most pros for me. It did in 2004 and still does today. Yes, a hard top would be nice but if I go that route, I'm going fully enclosed coupe style so no plastic at all except maybe in the stern. The hardtop does appear on signature 350, however I am unsure which year the hardtop was available. We have two hardtop 350s at our dock. Sorry to have been away from the Forum - been dealing with car issues - at least only one engine at a time. Wife bought me some LED lights for Christmas and am going to start working on lighting down below and to get a better configuration up top in the cockpit area. Also say a cool picture of someone who put lights in the blower exhaust area on the sides - really going to try to replicate. This Fall we are going to attack the gauges and electronics for the engines. I put a computer to it so I know how much my RPM gauges are off and can adjust accordingly. Just want to get more visibility to what's below the boat as the lake is high right now, but they are predicting a hot and dry (read drought) summer. I also want to clean off all the devices on the arch as they aren't used and I like the cleaner lines without a lot of "things" up there. Thanks man. I might not have worded my question right but what I meant is there a "retrofit" hardtop for the earlier models with the arch and bimini. I've seen the ones with the hardtop and the problem with any hardtop unless you have a huge sunroof is you can't remove it easily and get a full blast of sun at the helm/cockpit area. I bet you the windshield wouldn't allow it since it moves quite a ways back. Either way, beautiful boats. I really like that a lot. Great looking boat. At first I wasn't a bit=g fan of the way that round over stern was so blunt but it has grown on me. I like both style equally, this and the current one. Looking forward to the Boston Show next weekend but I doubt they'll have any Signatures there, unless it's the smaller ones like the 24 or 25 if they still make them. I will post photos of the fusion and the interface if I can ever get the photos to upload. I have tried photo bucket and everything else that I can think of, this site just will not accept my photos. Any help? I just started my Fusion install today on my 270. So far it's awesome! I got it so it would interface with my Raymarine MfD. As of right now I have the BT200 hooked up and also the ethernet connection to my router. It's so cool. The Fusion link app gives FULL control of the stereo when it's hooked up to a router. Can't wait to get it tied into my Seatalk NG network and get the transom remote installed! Thanks, what a great idea. We bought a 2002 350 4 months ago. Lads of questions, many answered here by truly a great bunch. This is ours coming home, 4 months ago, on its maiden 3 day trip from New Orleans to Seabrook. Since then, new microwave, new Cranck seal on the genie, new water pump on starboard engine, I updated all the inside lights to LED. New digital Seawatch antenna with bigger diameter, new VHF, and we got the camper enclosure fully redone as the Bimini was not an OEM and did not have any zippers. Wishing I had known at the time of buying. I finally found the origin of my loss of water pressure, the check valve on the water heater is blown. This after I replaced the hose from the FWT to the pump, thinking it was leaking since I had water in my midship bilge. ( and was that a fun project!!) Tried to fix the valve twice but won't hold pressure so I ordered a new one. Next project is replacing the fridge. And the old TV/VCR combo. Questions: on 2 of my ceiling panels, the vinyl has started to sag. A) what causes that? How do you fix it?